Does your city have lead service lines? See the map below for more details about a community's service line records. Because of Flint’s water crisis, regulators are asking water systems to answer a couple of seemingly basic questions: Where are Michigan’s lead water pipes? How many are left in the ground? We’ve found the answers are hard to come by. Lead leaches into drinking water from old lead service lines or lead solder, and from some plumbing in people’s home. A service line is the pipe that takes drinking water from the water main under the road into your home. Nowadays, those lines are usually made of copper, sometimes plastic. But back before the 1950s, lead was pretty common. “We know lead has serious and irreversible health effects and we also know that homes that are being served by lead service lines are really, essentially being served by lead straws,” Virginia Tech University professor Yanna Lambrinidou said. "The people living in those homes are eating and drinking out of lead straws." Back in the 1990s, the federal Lead and Copper Rule was passed to reduce lead exposure in water, especially for those people living in older cities, with lead service lines. Lambrinidou argues that people should be able to find out if their home has a lead service line, so that they can protect their families, especially children and pregnant women, from lead exposure. To be clear, cities are supposed to treat their water to prevent the kind of major lead leaching that’s happened in Flint. Every large water system in Michigan uses this corrosion control treatment. “But it is also equally understood to not be, under any circumstances, a panacea; to not be under any circumstances, to prevent at all times lead leaching from plumbing materials, including lead service lines,” she said. 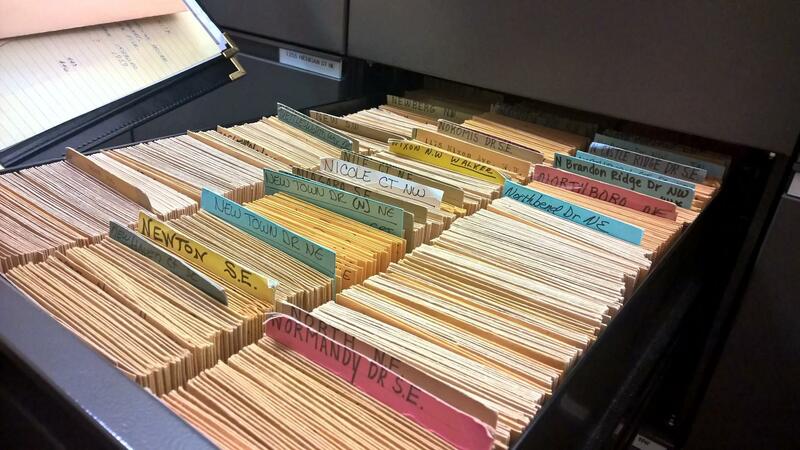 Service line records in the city of Grand Rapids live on paper in filing cabinets. There are scanned electronic versions too. Pipes still age and deteriorate with corrosion control treatment. Lambrininidou says stagnant water and physical disturbances can still cause high lead levels, even with proper treatment. That’s why it’s important for homeowners to know what kind of service line they have. It’s also important for cities to know where their lead service lines are, because that’s where they’re supposed to test to prove the corrosion control treatment is working. “Knowing where these hazards are is imperative for the protection of the public’s health,” she said. We know now that Flint’s records were in horrible shape. But your city might not be any better off. Officials in Saginaw, Livonia and Pontiac have pretty much no idea where lead service lines might still be. Places like Detroit, Grand Rapids, and Dearborn have rough estimates of how many lead lines they have based on the year a service line was installed. Scroll to the bottom of the page for a breakdown of the themes we found in cities across the state. Or click on the map to see more details. 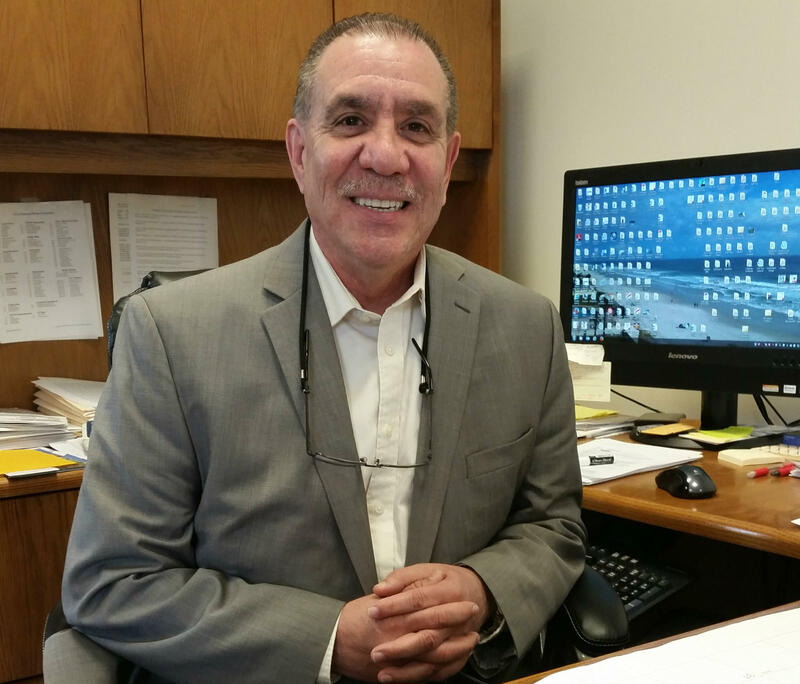 Jeff Castro is director of the Ypsilanti Community Utilities Authority. He knows where the 30 or so lead service lines are in his community because his predecessors created an inventory decades ago and they’ve kept good track of where they’ve replaced lead lines since then. “Creating an inventory is going to be difficult for communities who have not done much in the last 20 or 30 years because you can’t see underground. You are solely dependent on your records that your former predecessors put into place,” Castro said. Castro says he’d hug the workers who kept Ypsilanti’s records back then if he could. Because of them, Ypsilanti is in a good position now to provide the transparency regulators want from water systems, in light of the Flint water crisis. But because so many cities don’t have these records together, Michigan’s Department of Environmental Quality doesn’t know how many lead service lines there are in Michigan or where they’re located. Some cities have paper records, some are electronic, some only include information about the publicly owned portion of the service line. A study released this month estimates there are 460,000 lead service lines in Michigan; more than almost any other state. But that’s just a guess. Until cities have these inventories together, we won’t know for sure. The number of lead lines in Detroit is an estimate based on the year. Anything installed in 1946 or prior is assumed to be lead, although the older records don’t necessarily note the material of the service line. Detroit officials say they have everything on paper cards, and that it wouldn't be too difficult to get them online once they verify cards are accurate. Verifying would be Detroit’s biggest hurdle, but it’s something they say they’re working on. The good news; Detroit’s records also have some indication of what’s on the private property side. The estimated number of lead lines in Grand Rapids is also based on year. Officials believe 2,000-3,000 records are likely to be inaccurate or have unknown materials. City staff are working to clean up discrepancies in records over the next few months. On private property, records for service lines in Grand Rapids are less accurate. Kalamazoo: Officials estimate there are 2,800 lead service lines in Kalamazoo, but there are another 8,700 service lines made of unknown material. Records do not indicate the materials used for the portion of the service line that's on private property. Lincoln Park: Estimates 40-50% of 18,000 total service lines are lead. Officials say they’re not sure how accurate the records are as many lines went in before Lincoln Park was a city. They says there’s probably some discrepancy over the private property side of the line. Officials noted that the city recently emerged from emergency management and does not have the staff time or resources to compile or verify the records. Flint: UM-Flint worked through records earlier this year. They estimate there are at least 4,000 lead lines indicated in the records and 11,196 residential property parcels with "unknown" service line connections. EPA officials working to verify records have found many lead service lines do not exist as record indicates. Saginaw: Officials guess around 25% of “active” service lines are lead. That would be 4,750. They say there could be more but they're working to verify the active service lines first. They've found most lines on private property are not lead. Livonia: There is no accurate count of lead service lines, officials said. The city has records on index cards, but many cards do not list the type of pipe/material used. Officials note that, back in the 40s and 50s no one kept good records of material; the cards just note how long the pipe is and where the stop box is. Livonia is not currently attempting to locate lead lines, but replaces them when they find them during construction and informs homeowners. Dearborn: City officials say there’s an "abundance of lead service lines” but that it would be too difficult to find out exactly how many without “significant effort.” They do have paper records, and assume all service lines installed prior to 1950 are made of lead. Pontiac: Oakland County Water Resource Commission assumed operations of Pontiac's system in 2014. County officials say they knew they would encounter lead service lines but there is no accurate count or location of where those lines are. Oakland WRC has changed its policies to document service line materials in Pontiac. Port Huron: Officials believe there are lead service lines but do not know how many or where they are. They say the records they do have are not very accurate. The city is sort of an outlier in that it does not take responsibility for any portion of the water service line, only the water main. They have not tracked how many lead service lines have been removed. Jackson: Officials do not have an exact count of lead service lines, but estimate 54% of total service lines are made of lead. Staff believes records are "pretty accurate” though, noting "very seldom do we find a mistake." Records also indicate what's on the privately owned side of the service line. Battle Creek: Officials say record keeping “isn’t as precise” as they’d like it to be. There’s an estimated 4,000 lead service lines in the city but that number could be off by 500-1,000 lines. Warren: Officials estimate there are only “a couple hundred” of lead service lines left in Warren. City staff is working on sorting out how to compile and verify a complete inventory. Royal Oak: Officials weren’t sure if there were lead service lines. They said records for older homes in particular are "sketchy/rare." In the past 15 years, they've found around a dozen lead lines in total. Taylor: At this time, officials are working to determine the accuracy of paper records dating back to the 1840s. The records do not indicate what is on privately owned portions of lead service lines. St. Clair Shores: Officials say there probably are some lead service lines in the system. The original paper records indicate approximately 700 homes had lead service lines, but that number is likely outdated. Southfield: There are 25 known lead service lines, identified as part of the city's pool of homes where compliance testing is done. Officials say they have all the city's records on paper but no count of total lead service lines. Records do not indicate what's on the privately owned side of the line. Officials say if lead lines are discovered they're replaced. Lansing: BWL officials say records are "very accurate." Lansing takes responsibility of the entire water service line, even portions on private property. They have records in a digital database. The city has replaced more than 13,500 lead service lines since 2004. They intend to replace the last 600 by 2017. Wyoming: Officials believe Wyoming has no lead lines. Given that the city takes responsibility of the entire water service line, including portions on private property, officials are “very confident" in accuracy of records. But officials estimate there are a few hundred homes with no record of what the service line is made of. They're working to figure those out. Portage: No lead service lines in Portage, although old private wells could still have unknown lead lines built before the city was a city. Officials are confident in the records because the city takes responsibility of water service line even on private property. Many cities said their records were accurate or very accurate, but would also say they did not have an accurate record of the privately owned portion of the service line. Mark Brush, Rebecca Williams, Lindsey Scullen and Amelia Zak contributed to this report. The water crisis in Flint revealed that the city really has no clue where its lead service lines are. UM-Flint estimated there are at least 4,000 lead service lines in Flint, but there are another 11,000 lines that are made of an “unknown” material. The state is now recommending that cities avoid replacing only part of a water service line if it's made of lead. Partial replacements aren’t uncommon. Typically the municipality only owns part of the line, the part from the water main to the property line. This is the publicly owned portion of the service line. In this case, the part of the line that runs from the public right of way into a home is the privately owned portion of the line. The U.S. EPA is stepping up enforcement of the federal rule designed to prevent people from being exposed to too much lead in their drinking water. Today, the agency is sending letters to 49 states responsible for implementing the federal rule. The EPA already has the primary responsibility for overseeing the Lead and Copper Rule in Wyoming and Washington D.C. The state of Michigan is asking all water systems to come up with plans to find and replace lead pipes in their communities, even the portions of water service lines that are on private property, which are traditionally the responsibility of the homeowner.